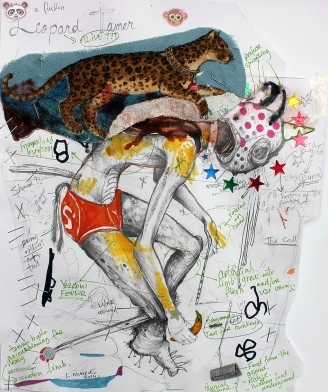 Lavar Munroe (born 1982, Nassau, Bahamas) creates multimedia works that explore themes rooted in the African Diaspora. Munroe grew up in the impoverished, stigmatized and often marginalized Grants Town community in Nassau, Bahamas. In 2004, he moved to the United States at the age of 21. 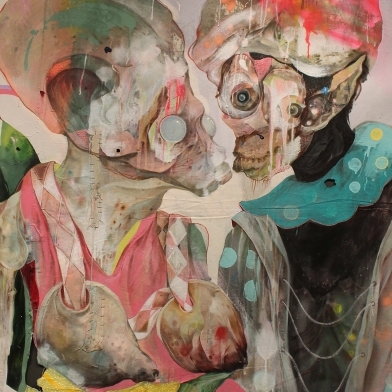 His work functions as a reflection of the environment of his upbringing, and draws from memory the crude graffiti on the walls that surrounded his street. The artist maps a personal journey of survival and trauma in a world of gang violence, drugs, murder, and self-discovery. Though inspired by the past, Munroe’s loud, energetic, and unapologetic visual language confronts contemporary society with the strained and difficult relationship between authority and those who are marginalized and oppressed by systems of power. Munroe’s most recent series, The Redbones, explores global political strife and societal ills including income disparity, war, and racism. The Redbones are a fictitious group of child-soldiers from poverty-stricken areas based on photographs and artifacts collected in Senegal. These cultural works straddle the line between painting, sculpture and installation, challenging narratives around survival, loss and trauma. 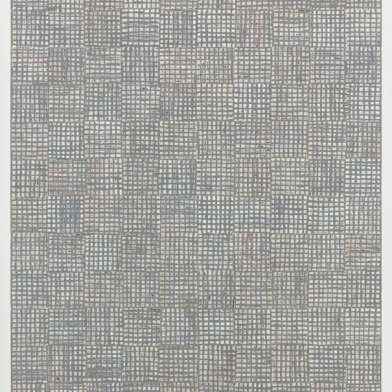 Munroe was a participant in Okwui Enwezor’s 56th Venice Biennale and Trevor Schoonmaker’s Prospect.4. 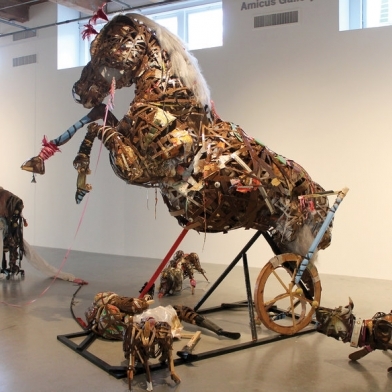 He recently had a Ten-Year Survey at the National Gallery of the Bahamas, which was accompanied by a monograph, Lavar Munroe: Son of the Soil, as well as a solo exhibition at the Meadows Art Museum in Shreveport, LA, Devil in the White City. In 2019 he will be showing in the exhibition Get Up, Stand Up Now at the Somerset House, a major exhibition celebrating the last 50 years of black creativity; the Perez Art Museum Miami exhibition, The Other Side of Now; as well as Coffee, Rhum, Sugar, Gold: A Postcolonial Paradox, curated by Larry Ossei-Mensah and Dexter Wimberly at the Museum of the African Diaspora, San Francisco. 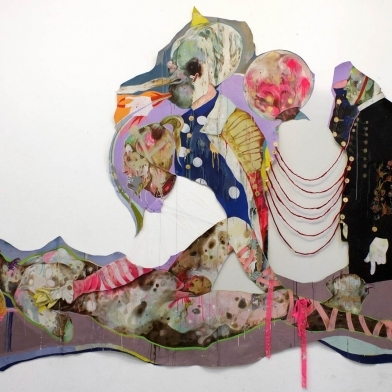 In 2018 Munroe was included in the following group exhibitions: Shifting Gaze: A Reconstruction of The Black & Hispanic Body in Contemporary Art, Mennello Museum of American Art (Orlando FL), African Metrópolis (Museo nazionale delle arti del XXI secolo, Rome), Off Biennale Cairo: Something Else (Cairo, Egypt), and Becoming American curated by Fionn Meade (Seattle, WA). His work was recently shown in Afriques Capitales at La Villette and the 2016 Dakar Biennale. 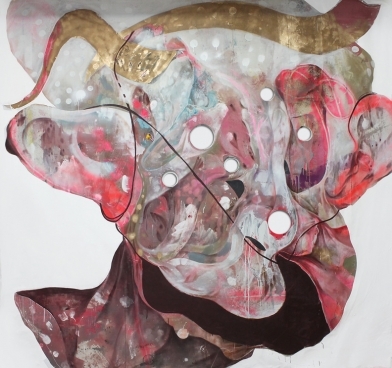 Munroe's works are in the Estate of Peggy Cooper Cafritz and are featured in Fired Up! Ready to Go! He has a MFA from Washington University, St. Louis, a BA from Savannah College of Art and Design, and attended the Skowhegan School of Painting and Sculpture. 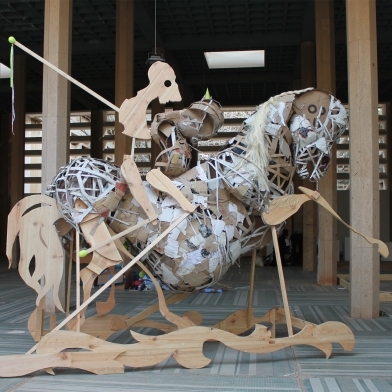 He recently completed a residency at the Headlands Center for the Arts, Marin County, CA, and has previously been an Artist in Residence at the Fountainhead Residency, Miami, FL. 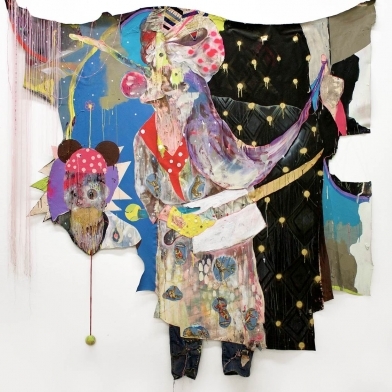 Munroe is a Joan Mitchell Foundation Painting and Sculpture Grant awardee. Munroe is a Visiting Professor at Indiana University. He lives and works in Indiana and the Bahamas. This summer, Somerset House celebrates the past 50 years of Black creativity in Britain and beyond, in a major new exhibition spanning art, film, photography, music, literature, design and fashion. This summer, Somerset House celebrates five decades of Black creativity in Britain and beyond, in a major new exhibition spanning art, film, photography, music, literature, design and fashion. 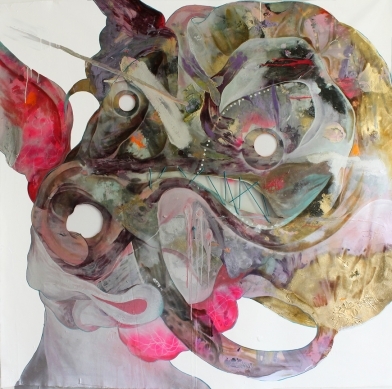 Taking Lavar Munroe's art as one of the examples, the article discusses about paintings made with unconvential materials to expande the definition of painting. A release from the unconscious mind. 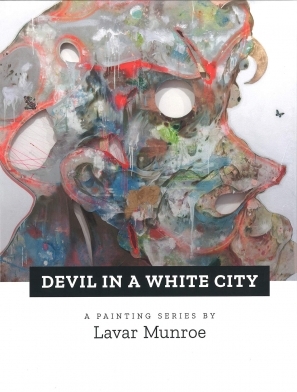 Devil in a White City: A Painting Series by Lavar Munroe released in Hardcover Edition. DEVIL IN A WHITE CITY offers a succession of essays and images that thoroughly illuminate Munroe's series of twelve large-scale paintings that bear the same title. "Though the term 'Devil' is affiliated with evil, I present my subjects as mere representations of those deemed to be devils in current world affairs as opposed to actual perpetrators of evil," writes Munroe. "Today, subjects of evil point to many authority figures such as police, politicians, clergymen, and terrorists, as some of the major culprits of much malevolent activity. The over-arching narrative is the destruction and mayhem in the world today, a world cloaked and tarnished by evil and deceit." 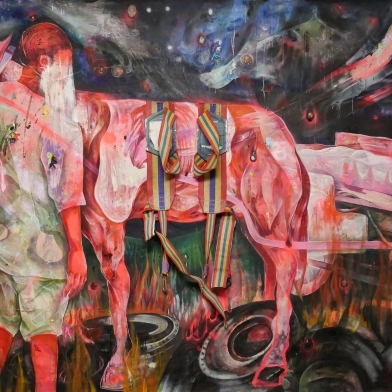 Munroe's paintings generate a lived narrative that is rich in symbolism and feels doctrinal, yet dreamlike. Each devil could be the insidious antagonist to an ancient, recently-unearthed text, or just as easily exist as "the bump-in-the-night" hiding under a bed in a child's storybook. Amanda Coulson, VOLTA artistic director and director of the National Art Gallery of the Bahamas points to 3 Solo Shows by Lavar Munroe as the most exciting exhibitions of the season. 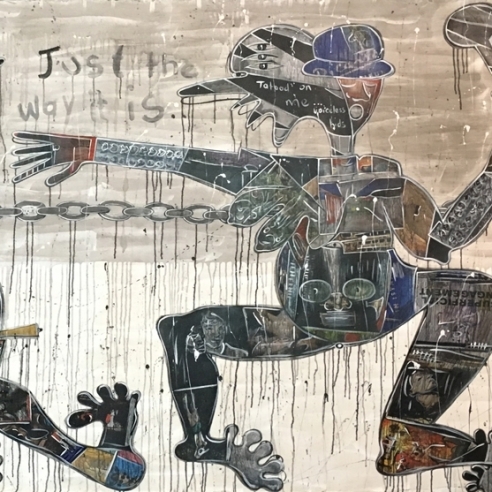 Jenkins Johnson Projects presents, Disobedience: Lavar Munroe and Rodrigo Valenzuela, which takes protest as a flash-point to explore current social and political unrest. 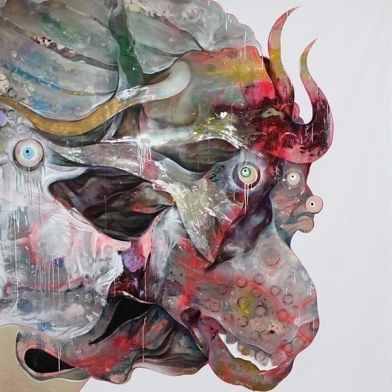 Through new large-scale paintings, photographs, and a collaborative site-specific installation, Lavar Munroe and Rodrigo Valenzuela create a dialogue between their very different styles and mediums. Munroe, from the Bahamas, creates bright and colorful mixed media paintings that integrate found materials, while Valenzuela, from Chile, creates black and white photographs that capture temporary installations. Yet, both artists find a close correlation on how they think about and research their subject matter. The Awards for Distinction recognize Sam Fox School alumni and other individuals for professional achievement in the fields of art, architecture, and design and/or for service to their profession, the community, or the Sam Fox School and Washington University. We are delighted to announce our 2018 Artist in Residence awardees, including discipline-specific awards for painting, social practice, and teaching. The 54 creative practitioners in this year’s lineup represent 15 countries, 15 states, and a multitude of practices that will come together here at Headlands with the direct support of fully sponsored, live-in fellowships designed to sustain their artistic processes. 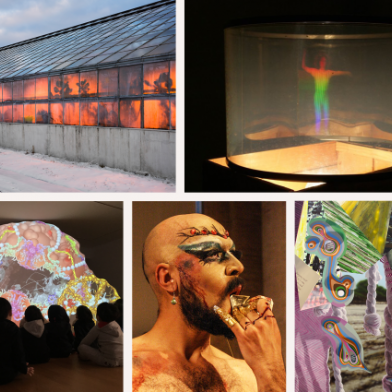 Artists will begin arriving for four to ten-week residencies starting in late February and running through November 2018. 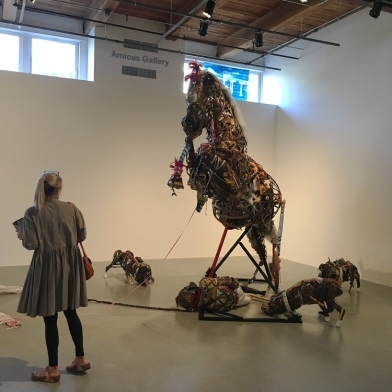 Biennials usually balance works from and about disparate places with site-specific projects and gestures toward local culture, often by local artists. As a site for such a show, New Orleans poses a particular problem, laden as it is with tradition and myth. It’s called North America’s most African city, its most European city, its most Caribbean city. It’s the “Gateway to the Americas.” It’s Catholic and carnivalesque. Its color could easily overwhelm the bland, flat globalism of the standard international exhibition. But curator Trevor Schoonmaker has risen to the challenge with Prospect.4, the current edition of the New Orleans triennial, titled “A Lotus Despite the Swamp.” With seventy-three artists and duos showing at seventeen venues, the show nods to both tourist-brochure boasts and the art world’s global purview in a way that invigorates them, by reanimating histories of trade and exploitation, fusion and exchange. 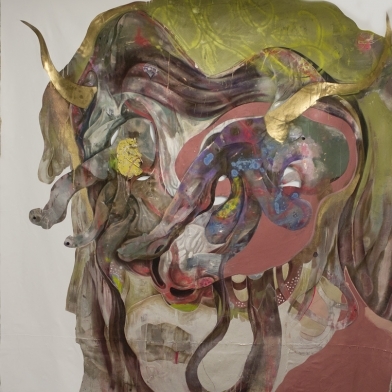 On November 16th-19th, 2017, hundreds of artists, curators, collectors and other art advocates, descended on New Orleans for “Prospect” its citywide art triennial, now in its fourth edition and currently subtitled “The Lotus in Spite of the Swamp,” curated by Trevor Schoonmaker (Chief Curator at Duke’s Nasher Museum). Founded after Hurricane Katrina, Prospect New Orleans was the brainchild of curator Dan Cameron, a self-confessed “Nola-phile” who had been invited to a public meeting about the role of artists in rebuilding their ravaged city. Having curated other international art events—in Taipei and Istanbul—and having seen first-hand the economic benefits that such happenings bring to their host cities, Cameron felt New Orleans was ripe for its own regenerative art project. Lavar Munroe (b. Nassau, Bahamas 1982) is an interdisciplinary artist whose work encompasses painting, drawing, sculpture, installation art, and a hybrid medium that straddle the line between sculpture and painting. His gorgeously warped paintings express elements of grotesquerie and beauty in a never-ending exploration of form versus abstraction. 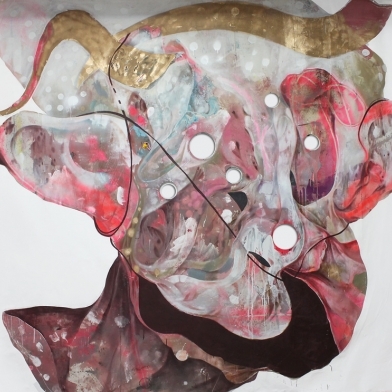 Congratulations to Lavar Munroe, who is a participating artist in Prospect.4: The Lotus in Spite of the Swamp, curated by Trevor Schoonmaker, Chief Curator, the Nasher Museum of Art at Duke University. Concurrent with Jenkins Johnson Gallery's presentation of his work at EXPO Chicago from September 13 - 17, Lavar Munroe will speak on the panel, Race and Representation in Contemporary Institutions,moderated by Perry Irmer, president and CEO, the DuSable Museum of African American History. Other panelists include Michelle Joan Wilkinson, curator, National Museum of African American History & Culture, and Bomi Odufunade of Dash & Rallo Art Advisory. Lavar Munroe's painting, Fallen, Godspeed, Glory (Angel No. 2), 2016, appeared on hit Fox TV Show, Empire, in its most recent episode, Toil & Trouble, Pt.1. In the middle of a heist, Munroe's painting is found hanging on the cover of a safe Cookie's sister, Carol, is sent in to crack. 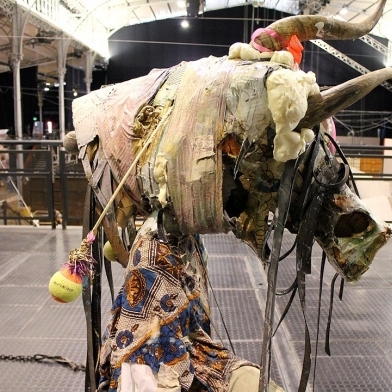 Afriques Capitales, contemporary African creation arose in La Villette! "There are no couches or cushioned seating in my studio," says young Bahamian artist Lavar Munroe, "because for me the studio is not a place to be comfortable." For Munroe, his studio in Washington, D.C., is a "sacred space," a place to turn off his phone, disconnect from the internet, and delve deeply into a process that he trusts but can rarely predict where it will lead. 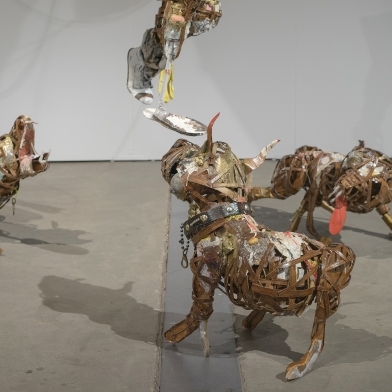 SAVANNAH, Georgia — Contrary to his gentle voice and friendly manner, Lavar Munroe’s first U.S. museum exhibition, Journey Elsewhere: Musings from a Boundless Zoo, is filled with grotesque half-animal, half-human figures wielding hostile gloves and knives like predators. 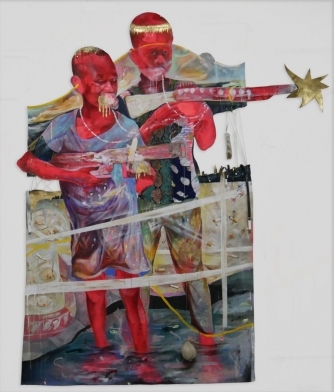 Currently on display at the SCAD Museum and the Gutstein Gallery in Savannah, Georgia, the Washington, DC–based artist’s paintings, sculpture, and installation explore the politics of power, subjugation, and othering. Munroe’s personal version of the contemporary zoo was inspired by his interest as an undergraduate in the “human zoos” that exhibited Native Americans and Africans through the 1950s, as well as his memories of death and violence while growing up in the Bahamas. South Africa’s traumatic social history, its remarkable transformation and its diversity of culture and landscape, is a crucible for creative engagement. NIROX offers residency to international and local artists, providing insight and access to the region’s extraordinary cultural and environmental heritage. Conversely, artists bring their spotlight into the region. The program has no predilection for style or dogma, emphasizing work that is relevant, challenging and uplifting. In 2014 FHE established a Visiting Artist & Master Printer program with the goal of creating a world-class program that promotes creative interaction between professional artists and students while also creating sustainability within the printmaking field—by training the next generation of artists and printmakers.